Auction123 provides Trailer dealerships with the best solutions available for managing and marketing trailer inventory online. 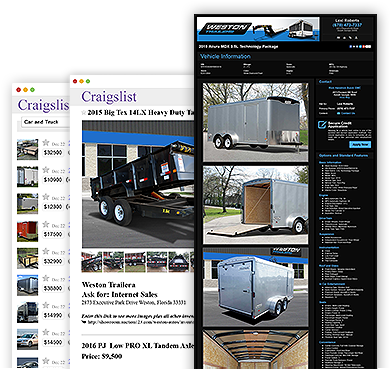 Craigslist posting tools for trailers, eBay tools for listing trailers on eBay Motors and eBay’s Business and Industrial categories, and dealer websites are combined with our trailer inventory management system in one centralized solution. We provide everything you need for generating leads and marketing your trailer inventory online. Auction123 is an award-winning website provider offering professional website development for trailer dealers. Let us work with you to create your dealership’s custom branded site complete with content editing tools so you have the control to make changes anytime. 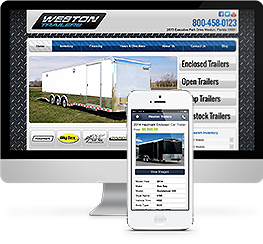 Providing your shoppers with mobile friendly websites and mobile inventory displays to shop your available trailer inventory gives both you and your shoppers the convenience of browsing inventory from a mobile device. Plus, our mobile photo application makes capturing your trailer inventory images a breeze. Auction123’s inventory management solutions provide trailer dealers with everything you need to effectively manage inventory including tools like our data management controls, detailed unit marketing emails, and inventory reporting. As an eBay Motors Preferred Solutions Provider, Auction123 offers the best eBay listing tools for trailer dealers. Turn eBay into your dealership’s #1 source for leads with customizable eBay templates and powerful bidder contact information. Our Craigslist posting application for trailer dealers lets you easily list inventory on the #1 Classified site in the US. Our hands-free application provides an automated tool for getting your trailers live or cherry pick which units to post using our Craigslist posting scheduler. Our award-winning Facebook inventory application provides a Facebook inventory showroom plus wall posting functionality so you can choose exactly which trailers you want to market directly to your Facebook fans. Auction123 can import trailer inventory data from virtually any provider who can send us a file of your units and images. Even manually building your trailer inventory into the Auction123 system is a breeze. Auction123 supports the distribution of your horse trailers, cargo trailers, car haulers, and other inventory to over 400 online marketplaces, classified sites, and service providers. Get your trailers ready for the Internet by entering custom descriptions, bulk uploading and editing your images, adding YouTube videos, customizing your inventory showroom presentation, and managing your pricing from our easy-to-use inventory merchandising tools.